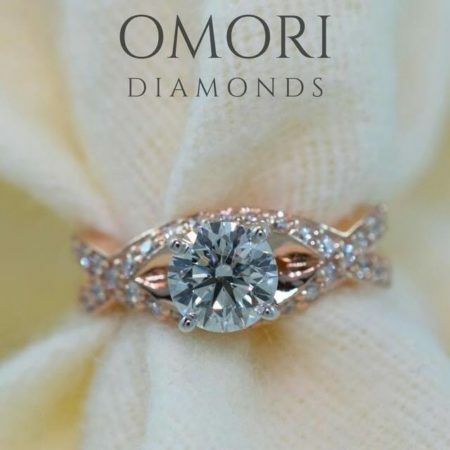 Omori Diamonds specializes in crafting exceptional rose gold engagement rings in Winnipeg. Meet directly with our diamond expert and designer to receive undivided attention to creating your perfect dream ring. Rose gold engagement rings are currently trending in popularity at the moment not only in Winnipeg but all across Canada and America. 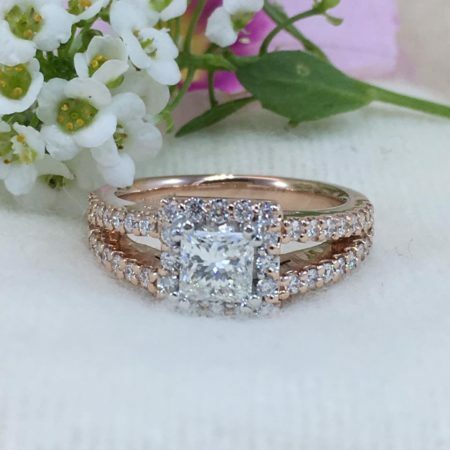 With celebrities such as Blake Lively and Lauren Conrad sporting elegant rose gold engagement rings, as well as the huge popularity of rose gold rings on instagram, we expect to receive many more requests from couples looking to create their perfect ring in this warm shade of precious metal. Known for its versatile and timeless appearance, rose gold has been a favourite choice when it comes to both modern and vintage inspired designs. As a premier designer and creator of custom engagement rings in Winnipeg, the options are literally endless when it comes to the design that you wish to create. This beautiful six claw solitaire engagement ring has been one of our most loved designs and features a modern, tapered band as well as the claws being made in white gold for colour contrast. This tiffany inspired design is sure to retain its timeless appeal for generations to come. Another favourite on social media, this rose gold princess cut diamond engagement ring is the perfect design for sparkle lovers! With its square diamond halo and double side stone band, this ring has been designed with pure brilliance in mind. Love halo rings? Check out our article on halo engagement rings. This rose gold engagement ring features a bright and beautiful oval cut diamond in the centre, as well as a beautiful side stone band. Another trending favourite, oval diamonds are one of our most requested diamond shapes! 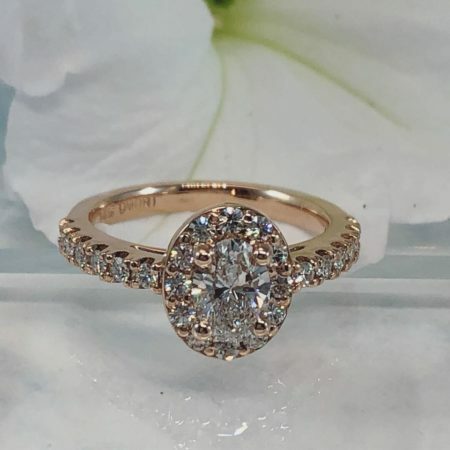 The perfect design for those who love antique and vintage engagement rings, this design features detailed styling on the band and has been another favourite on our instagram account. 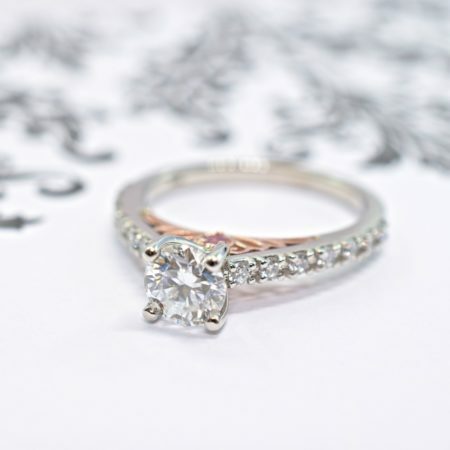 To see more of this detailed rose gold engagement ring design, check out the video HERE. Sometimes colour contrast can be the perfect way to liven up your design. 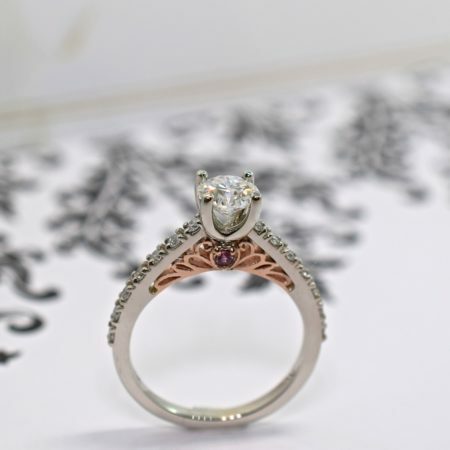 This custom engagement ring features the beautiful combination of rose and white gold with the bridge showing off a detailed vintage inspired design with a pink sapphire set in either side. This beautiful custom ring incorporates the colour combination in the winding infinity band. 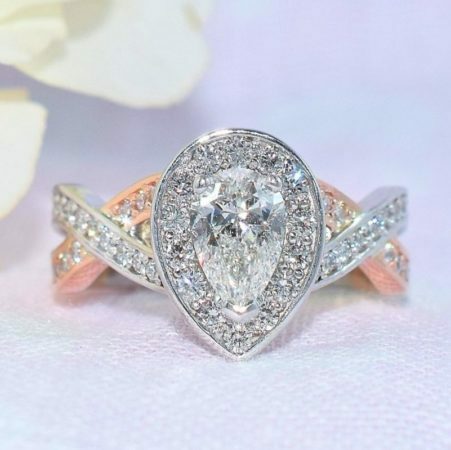 Another design sure to produce massive amounts of sparkle, this ring features not only a brilliant pear shaped diamond but also a stunning halo and two criss cross side stone bands. If you love this colour combo, be sure to check out our article on rose and white gold engagement rings. 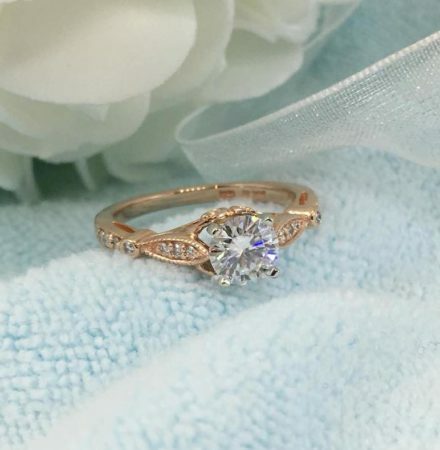 Are you ready to create your perfect rose gold engagement ring in Winnipeg? Book your free appointment with an award winning jewellery designer now! 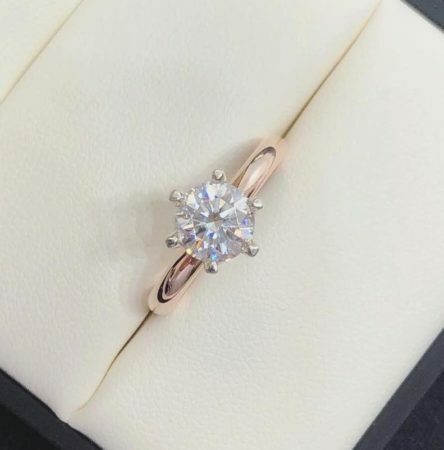 Want to see more rose gold engagement ring designs? Check out our engagement rings page to see our custom portfolio and catalogue of ring designs.